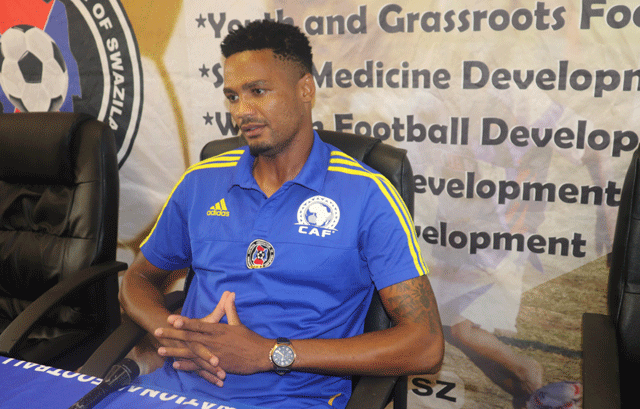 SOCCER – SIHLANGU captain Felix Badenhorst and striker Sabelo ‘Sikhali’ Ndzinisa are set to come up against familiar foes when Sihlangu take on Tunisia in an AFCON qualifier in Tunisia tomorrow. No less than five of Tunisia’s squad is formed by players from both CS Sfaxien and Etoile du Sahel. Swallows played Sfaxien twice in the group stages of the CAF Confederations Cup in 2017, losing 0-1 away and 3-1 at home. Interviewed before Sihlangu departed for the North African country on Tuesday, ‘Sikhali’ said they were fully aware of the brand of football they were likely to come up against when they face Tunisia. He said where possible, they would impact advice on their teammates on what to expect and how to cope. “It is not a secret that the key ingredient to their game is high tempo football. We are fully equipped to deal with it. The players have shown at training that they can cope, and I am confident that we can overcome them,” he said. The ‘Beautiful Birds’ faced Etoile du Sahel in the group stages of last season’s CAF Champions League, and lost both matches, 0-3 at home, and 0-2 away. Badenhorst said they were familiar with the Tunisians’ style of play and are ready to deliver. “I have full confidence in the players we have that they can cope with the clever tactics predominantly used by teams from North Africa,” he said. Sihlangu lost the first leg of the AFCON qualifiers 0-2 at the Mavuso Sports Centre in September.